January 1, 1981 One crewman was lost when the fishing vessel Mercy Bee capsized in heavy surf in Squaw Bay. January 16, 1981 The 86 foot fishing vessel Cory P sank off of Aberdeen, Washington. Captain Paul E Vine Jr, Rick Weekly, Doug Nelson and Carl Chater were all lost with the boat. February 13, 1981 The trawler Wood Duck sank near Union Bay with the loss of one crewman. February 28, 1981 The 291 foot cargo ship Dae Rim out of Pusan, South Korea caught fire 90 miles west of Attu with the loss of 24 souls. Only two crewmembers survived the disaster. 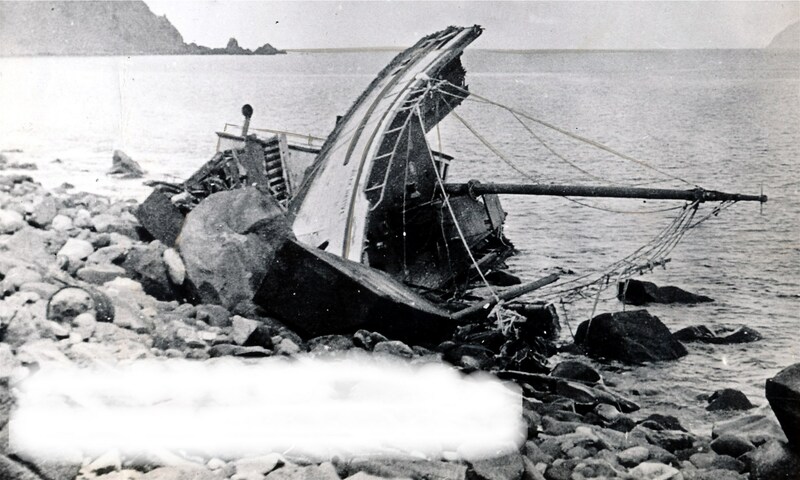 March 13, 1981 The Japanese trawler Daito Maru No 55 sank 380 miles NW of Adak with the loss of 26 souls. March 27, 1981 One person was lost when an unnamed logging boat sank in calm weather near Wrangell. May 2, 1981 Curtis Wyatt was lost overboard from the Yardarm Knot 80 miles west of Port Moller in the Bering Sea. May 5, 1981 The seiner Alaskan Rose grounded at Mountain Bay near Rugged Island and one person was lost. May 12, 1981 Lee Andrich, part owner of the vessel Enterprise, suffered a blow to the head by the crane and was knocked overboard. He managed to swim back to the boat but died aboard the vessel. May 12, 1981 Peter D Reamy was lost overboard from the Sadie Ann. May 19, 1981 The 65 foot Bering Scout was lost In route to Kipnuk Bay along with three crew; Robert Wangen (27) of Seattle, Mike Bosco (37) of Chefomak, and Bob Pruit (28) of Seattle. May 24, 1981 Three people died from poisonous fumes aboard an unnamed pleasure boat in Thumb Cove, 7 miles from Seward in Resurrection Bay. August 7, 1981 U S Coast Guard helicopter HH3F crashed near Naked Island in Prince William Sound while on a rescue attempt. Lost were Ernest Rivas, John Snyder Jr, Joseph Spoja and Scott Finfrock. August 20, 1981 The 96 foot floating processor Northern King of Kodiak capsized and sank 50 miles southwest of Port Moller in Bristol Bay. Five of the crew made it to safety, but James A Eiden (55) of Everett WA and Eric Willis of Anchorage were lost. August 21, 1981 Two persons were lost when the 32 foot Rocket overturned in heavy seas in Strawberry Pass near Montague Island. October 29, 1981 Jens Jensen, captain of the 96 foot fishing vessel Vestfjord, was killed when a large wave struck the wheelhouse. October 30, 1981 The 54 foot Gem sank near Cape Spencer. David Miller, Larry Miller and another brother were picked up by the Coast Guard in a C-130. The fourth crewman, Tim Blake, was lost. November 8, 1981 Keith Richards fell overboard and was lost off of the Golden Pisces 150 miles NW of Dutch Harbor. November 13, 1981 Kaino Dixon and Dwight Florin were lost off of the fishing vessel Cougar while taking a skiff to the beach at Sitkinak Island. November 27, 1981 The fishing vessel Nannie D sank somewhere southwest of Seward with the loss of three people. November 29, 1981 One person was lost when the 32 foot crab fishing vessel Norwegian Wood capsized and sank 45 miles southwest of Homer in Cook Inlet. Four others were rescued by the fishing vessel Mary M.
November 29, 1981 All twelve of the crew of the St Patrick abandoned ship outside of Marmot Bay thinking the vessel was going down. Bob Kidd and Wally Thomas were the only survivors. Ten were lost including acting captain Cornelius Green, Vanessa Sandin, Ronnie Newton, Randall Ryker, Gary Stallings, Clifford Stigall, Charles Parlett, Thomas Kauppinen, Wilson Pair and James Jobe.